Halo Spartan Assault will feature Halo 4's Commander Palmer and will be set between the events of the third and fourth games in the sci-fi-series. Here's the official word from 343 on the Palmer's role in the game. How is Palmer’s role different in Halo: Spartan Assault and Halo: Initiation? Brian Reed: This is the story of how Palmer became a Spartan. Its early days in the Spartan IV program in this story and they’re looking for the first recruits into the program. But to get recruited into the program, you’ve got to have done something pretty spectacular. 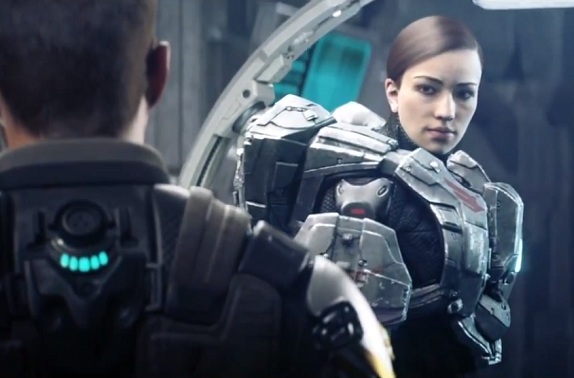 This is the story of what Palmer did, what happens on her first mission as a Spartan, and how the events of that mission set in motion her eventual placement as Infinity Spartan Commander. What are some of your favorite things about writing for this character? Brian Reed: Palmer’s a lot of fun to write because she’s half-way to a force of nature. She has a lot of “shoot first, ask questions later” in her bones, and so far in her life that has proven to be the best operating procedure. Of course the day will come that her style backfires and she realizes she needs to learn about something the rest of us call “subtlety.” Luckily for us, she’s got a Brute to fight in this comic, so that day’s not here yet. Can you talk about some of the story connections to Halo 4 fans can expect in Halo: Spartan Assault and Halo: Initiation? Brian Reed: Palmer’s in both stories, as is Spartan Davis, another of the recruits we meet in INITIATION. Over the course of the comic we see their first meeting, and their partnership develop. Since the two of them are what stands between UNSC forces and certain doom in Spartan Assault, it’s interesting to see how they got to know one another. What kind of questions will Halo: Spartan Assault and Halo: Initiation answer about Palmer? Brian Reed: The two big questions we aimed to answer were “How did Palmer become a Spartan?” and “What did she do that was so impressive the Spartans made her their Commander?” The answer to both of these questions involves a lot of heavy weapons fire, explosions, humor, and adventure across a dangerous and exciting galaxy. You know… Halo stuff.